Silberra U series b&w photo film is the first new film from Russia. High contrast mixed grain emulsion, which combines both flat grain and classic grain, allows this film to save high resolving power of T-shaped silver grain preserving natural tonal softness of classic emulsion. The first batch of the film becomes available in retail at June 2018th and it shall be considered as open test batch. Silberra U200 film can be exposed at EI (ISO) 200, 100 and 400, preserving acceptable contrast ratio and dynamic range width; Silberra U400 can be exposed at EI (ISO) 400, 200 and 800, preserving its contrast and dynamic range qualities at appropriate level. Silberra U gets its letter-name as the heritage from Silberra ULTIMA series, which is based on the same substrate: thin, straight and crystal clear. Silberra P series with PAN-class (thicker) substrate is planned for production within 2019th. Thanks to unique anti halation and protective layers the film acquires distinctive green tone when unexposed. Similar to ULTIMA series, Silberra U shall need lower power of the light source when scanned or printed. Due to special anti-curling layer it will also preserve the absolute flatness of the negatives. loading the film into the development tank's reel double check that the reel is dry; using wet reel may cause film to be displaced within the reel and that may damage the film. In order to counterweight possible overexposure of the first frame we placed 37-th exposure there in Silberra U series film. Should you be uncertain about complying with the first precaution rule, feel free to start shooting from the second frame. 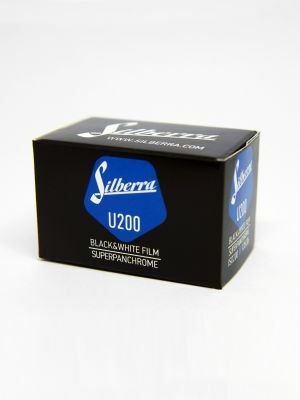 We're sure that Silberra U and P series shall take its part of the market; those photographers who were searching for the film to aggregate both high resolution and classic width of tonal range within one product shall be very happy with the results Silberra U and P series provides for each image.